The Cafesjian Center for the Arts (CCA) announces the opening of a landmark exhibition, Kochar: Challenging the Time, dedicated to the 115th birthday anniversary of the celebrated Armenian artist Ervand Kochar. Organized in partnership with the Ervand Kochar Museum as part of CCA’s Museum Networking program, the exhibition brings together a brilliant selection of works including masterpieces from Kochar’s Paris and Yerevan periods. Featuring thirty works from the Ervand Kochar Museum and private collections, Kochar: Challenging the Time offers a unique opportunity to experience the development of Kochar’s ideological and aesthetic world through the medium of painting, graphic works, sculptures and his groundbreaking form of plastic art “Painting in Space”. The exhibition focuses on Kochar’s evolving artistic vision, revealing how Kochar’s imagery went through a constant process of metamorphosis. Arriving in Paris in 1923 at the age of 24, from the very first months, he firmly launched his career in the complex and alluring artistic environment of the city, exhibiting with leading artists of the era. Within a short period his art was regarded as “deeply cognitive and unmatched in terms of execution”, “innovative”, “avant-garde and the most audacious”. His return to Yerevan in 1936 had a dramatic impact on his life and creative development, as in a totalitarian regime Kochar’s progressive and innovative art was regarded as “anti-Soviet and anti-revolutionary”. However, Kochar’s genius asserted itself in a new manifestation of expression, reflected in a liberating gesture of his national identity. Kochar, who in his native land became the symbol for avant-garde art, the new, and of freedom, revitalized the struggle for the spirit of national identity, animated in his monumental sculptures Davit of Sassoun and Vardan Mamikonyan. Kochar’s work, expressed in a new vision of freedom in time and space, challenged the ideals of his epoch. 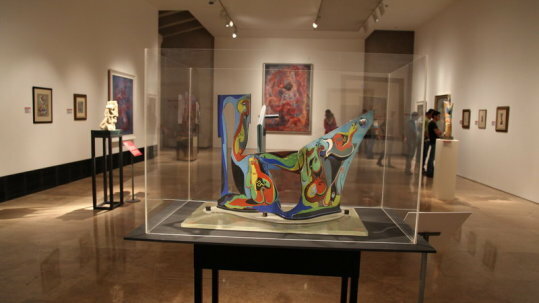 The exhibition, Kochar: Challenging the Time, discloses for us, once again, Kochar’s creative genius as one of the greatest artists of 20th century modern art. The exhibition continues through December 14, 2014. The admission is free.